Not All Who Wander Are Lost: Marathon! My ice marathon is complete. I feel like my marathon can best be summed up by a Violent Femmes lyric, "Second verse, same as the first!!" If you aren't into running (and even if you are), this will probably bore you. 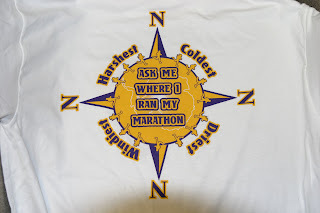 On May 20, 2007, I ran my first marathon on Colfax Avenue in Denver, CO. I had completed an abbreviated training schedule with the help of Pam Campbell (especially in the early stages). I had run a 22 mile training run about a month before the marathon and then sprained my ankle two days later. I did not run again until the day before my marathon when I ran 2.5 miles around Sloan Lake. The day of the marathon, I felt ready though. At 1/4 done, I was on track for my goal of a 4 hour marathon. At 1/2, I was still on track for 4 hours, but something was going on in my legs that I think was caused by compensating for my sprained ankle. At 3/4 done, I had slowed to a four and a half hour marathon finish. During that stretch something else started hurting a lot in my legs. I would learn later it was my IT band. I had to slow to a walk which quickly evolved to a limp because I kept trying to run on it. At Sloan Lake, the 3/4 mark, I was a very short distance to my house and six miles from the finish. Perhaps because it was my first marathon, perhaps because I'm stubborn, I chose to limp out that last six miles. I kept trying to run, but it never worked. It made matters worse. Major points to John Bain who gave me a ride at 4am and then, thinking that I would be finish in 4 hours, waited until I drug myself across the finish line at 5:28:03 (Net Time 5:27:45 whatever that means). I was happy I even finished considering how little training I had done the month before the race, but a small part of me was still bummed because it had looked like I was going to meet my goal. Fast forward to January 20, 2008 as I'm about to attempt my second marathon. I was training like a machine. My primary goal was to be able to run the entire race, unlike last time. My secondary goal was to run it in 4 hours, but that seemed unlikely across snow and ice. However, one month before the marathon I turned out 25 miles in 4:10. I felt great all through the training run and realized that a 4 hour marathon may be within my grasp. I got excited and entered my taper phase. I ran two short runs the week after the 25 miler and then did a 17 miler the three weekends before the event. The week after that, I did one short run and then 8 miler with an hour of ultimate in the snow on the weekend. After that, I had two full weeks before the marathon. I had planned on running the next to final week and weekend but didn't because I had two roommates quarantined with the flu and didn't want to risk lowering my immune system and getting sick for the marathon. I was worried that I had tapered too much, but I still felt good and the conditions were perfect. Getting ready for the big start. I went out alright and shared 2nd place for the first hour with Dave Z. The guy in 1st must have been a mile ahead of us. Stud. At the start of the second quarter, Dave and I were passed by a group of three runners. We decided to catch them by the halfway point and surged back to them by mile 12. However, that was the last I would see of any of them. My IT Band started to hurt then (different side than my other marathon). I kept running hard until the half way point which I reached in 1:47. If I had been able to keep up, it probably would have been 1:40. I was excited, but also realized that the same thing was happening. I could run myself into a limp again or take it easy and walk jog the rest of the race. I chose to try and take it easy. Another racer, Richard, had the same problem with his opposite leg. We considered attempting to do a three legged race, but instead just ran together until mile 22 where he was able to keep moving along while I broke into a walk-limp because I had tried to run one too many times. I even attempted to power walk which I've often wondered the point of. I think the point is this - by really pumping your arms, you remind yourself to keep going faster. When I didn't pump my arms a lot, I let my legs slow down as well. I believe I finished in 4:51:21 to lots of cheering from fellow racers and event staff. I couldn't believe I had finished in under 5 hours, but I guess power walking is faster than limping. The winner crossed in 3:26:30. Major kudos to the event staff, recreation department, and spectators. They put on a great with tons of support for the 75 or so people who ran or skied the full and half marathon events. To answer a couple questions that came up. There were aid stations that had gatorate, water, and Luna bars. I put up a map that shows them. At one of the midway aid stations, the water had ice in it when I went to drink it!!! Awesome job, dude. You're a better man than me. So only five continents to go, right?